This would perhaps be a non-story but for the character at the center of the second photograph. During Trump’s inauguration, the crowd was so scant compared to Obama’s inaugurations that the president’s [then] spokesman – his name is part of the essay’s title – went on a hyperbolic description that has now led to the mockery that took over twitter since yesterday. 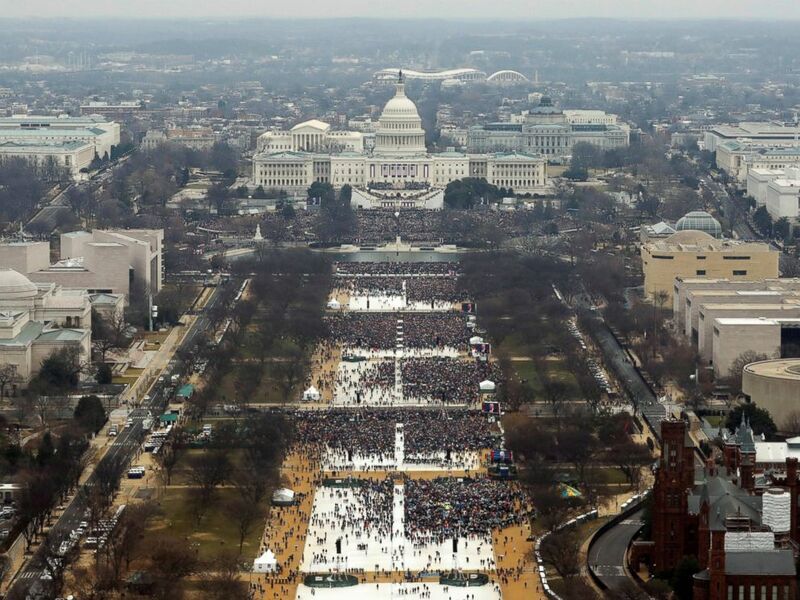 He claimed it was “the largest audience to ever witness an inauguration, period” even though analysi showed the crowd at Trump’s inauguration was about a third the size of Obama’s first inauguration in 2009. During the Obama Administration, tickets to the National Christmas Tree Lighting were nearly impossible to come by. You had to enter a lottery (and best to do so in the first hour it was open) and hope. I entered every year and never got one. But my niece, Kate — who was here in Washington, D.C. in college for four of those years — had some sort of magic horseshoe in such things and got standing room tickets the first three years and, when she was a senior, eight seats. During the Obama Administration, seats were as scarce as hens’ teeth, because so many people wanted to attend that most of the tickets were for standing room. The year Kate scored those seats, she invited me to have one (and I was so excited) — but I broke a tooth the afternoon of the Lighting and it was freezing cold and I had to give it up. She and her friends enjoyed every minute. As did thousands of others. Last Christmas, I didn’t even enter the lottery. I couldn’t bear the thought that this would be the last Christmas with our joyful, hopeful, kind, smart, stalwart President — and his beautiful family — lighting the tree. I did watch a rebroadcast that evening, though. It would be interesting to see what spin Sarah Sanders will put on this! Oh, yeah; she is a worse spinner – nay, liar – than the one before her. As someone has described her, “… she must have been a born liar”!